Our First California Company will be joining other lineage societies on Saturday, January 18 at the Los Angeles Athletic Club for two meetings that should be of importance to all of us. Company members have been invited to convene at 10 AM for a business meeting to consider a major revision of our bylaws, complete preparations for our March 2nd commemoration of the 400th wedding anniversary of Pocahontas and John Rolfe and elect a nominating committee to recommend a slate of officers for election at our annual meeting in the late spring. After we adjourn, our hosts, The Society of Colonial Wars in the State of California, have invited us to join them for a luncheon and program featuring as guest speaker their National Society Governor General Gerald Gettes Tyrrell, who will discuss Why Hereditary Societies are Important; Keeping Them Relevant and Solvent. Governor General Tyrrell was born in Canton, China, the son of a British diplomat and a “Southern Belle” from Kentucky. He was raised in Louisville, Kentucky, graduated from Yale University and took a graduate banking degree from Rutgers University. He retired after thirty years as Executive Vice President from Kentucky’s largest bank. He then worked ten years for the City of Louisville as Chief Financial Consultant, and later was Vice Chairman of the Board of Porcelain Metals Corporation, a privately owned industrial company. Gerald joined the Society of Colonial Wars in the Commonwealth of Kentucky in 1969 and was the Kentucky Society Treasurer from 1970 until 1989; Secretary from 1996 until 1999 and Governor from 1999 until 2005. He was elected Treasurer General of the General Society in 2004, Lieutenant General in 2007 and Governor General in 2012. David Hayball, a member of the Jamestowne Society, is currently the California state society’s governor. The Sons of Liberty Chapter of the Sons of the American Revolution will co-host this meeting. There will be a cash bar at 11:15 AM and luncheon will be served promptly at noon. 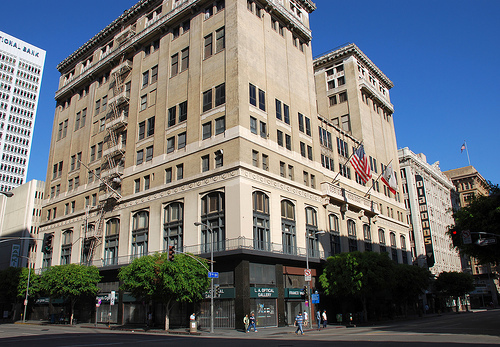 The Los Angeles Athletic Club is at 431 West Seventh Street, in downtown Los Angeles. The event cost is $40 with luncheon entree choices that include hanger steak, Atlantic salmon and vegetarian pasta. Parking is available at the club’s adjacent garage for $3.50. Attendance at the luncheon and program will be by reservation only with the Sons of Colonial Wars, which must be confirmed by Wednesday, January 15, 2014. For more information or details, please contact our Governor. Following these events, there would be a unique opportunity for a couple of hours of genealogical research nearby at one of the best resources in Southern California at the History and Genealogy Department of the Los Angeles Public Library. This entry was posted in 2014, 2014 Meeting, Early American History, First California Company, Genealogical Help, geneaology, Jamestowne Society, january 18 meeting, News, Pocahontas, Winter Meeting. Bookmark the permalink.